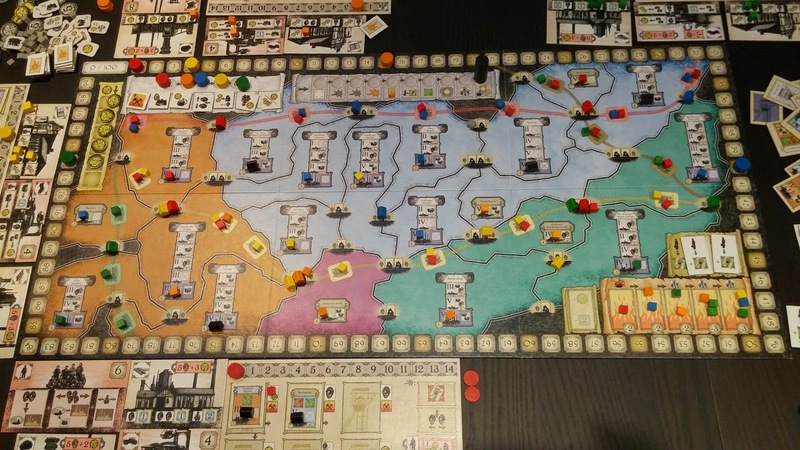 Push Your Luck Podcast: 9 August: Building ships and a coal empire! I have mentioned in my previous post and my latest youtube review that I really liked Kohle and Kolonie. So much so I was contemplating what strategies to try in my next game of K&K. So its little wonder that we manage to table it again when we had 5 players, 2 of which are new to the game. I decided to go with wagon strategy just to see how well it can be. Seeing how we all got creamed in our first game of K&K by a friend that did the wagon strategy, I was hoping to finally get a win here. Alas, it was not meant to be. I was steaming ahead in the first few rounds but after a lost consolidation and hitting the various disasters (I am the ORANGE player), the wagon strategy got impacted in the later rounds. I did not have as many wagons so it was not earning as many points as I had hoped. I was also slightly distracted and tried area scoring as well. BLUE player did not go for a wagon strategy but managed to flip most of her pithead tiles AND score a truck load of points in area control in the later rounds. It is really impressive how she managed to flip and score so many points. I could barely flip 2 of my pithead tiles as I concentrated on my wagon strategy. One interesting thing this game was that the mining disaster that would have cost us points or money when the beige disc was taken out of the bag came in at the final round so did not impact us too much. Otherwise it would have been quite costly. Mai-Star was also played with 6 players and this was one instance where I fully utilized my gei-sha's power (Summer sea) and caused a lot of hurt to everyone else in my first 2 rounds. In my first round, I managed to discard 1 card to block an effect and then play 1 blue customer followed by a second one (gei-sha power) that cleared my hand and cost players a lot of negative points. My 2nd round, I played the monk and that cleared my hand very early on and again cost players a lot of negative points. The 3rd round took much longer than usual as players were trying to block me and score enough to get back into the positive zone. Another player played the monk because he was fairly confident he was not last but alas he miscalculated and was last. I won with only 10 points though. So this time it was interesting to see how the luck of the draw can really impact the game. I also think it caused some players to feel abit disgusted at the game. 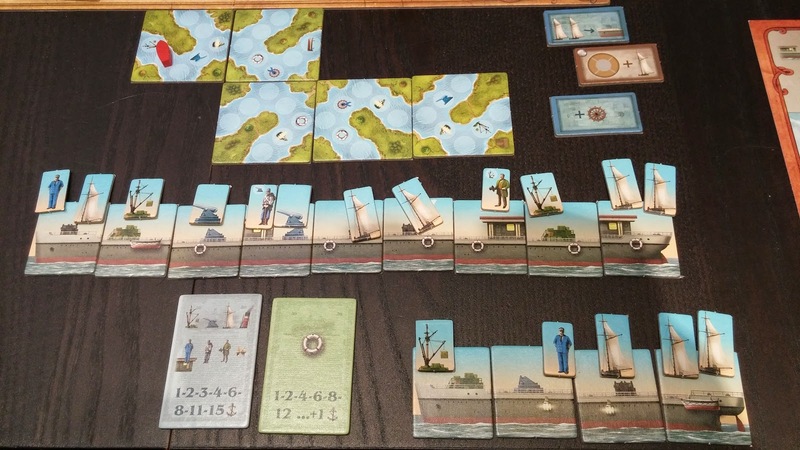 Shipyard was something I had heard about mostly because of the rondels but there are mixed reviews. Since I had not played this before I asked to try it to see what its like. Its my first game but the other 3 players had played this before. Even so, after going through the rules, 3 of them realised some of the rules they played previously had some mistakes so in some ways, this is the first correct game they played. Shipyard is a game where players are trying to gather resources so as to build ships and create their own fleet. Points are scored from sailing these ships and completing secret objectives. There are also points to be scored from hiring the right employees/benefits. During your turn, you shift your pawn to another action tile that is ahead of your existing position. This is similar to Glen More and is probably the more interesting part of the game. Not only will this rondel determine what actions are available, the choices that the other players make will also determine how much money you can get and what resources you can get. This is also not the only rondel available. There is a rondel which determines the personnel available for your ships, a rondel to determine what components you can fit on your ships, a rondel that determines the prices for the train wagons when you sell as well as a wagon to determine the employees/benefits you can obtain. I know what you are thinking, SO MANY RONDELS ? Really ? Essentially they are seperate rondels and function independently, but because they are so many rondels, it makes this game a very tactical game. There is some strategy as you plan ahead to see how you can fulfill your objectives but tactical because what the other players do will determine what action you can do during your turn AND what items you can receive. Ultimately though, you will be completing ships and sending them on their way. You will get points depending on the speed of your ships as well as the various components and personnel you have set sail with your ship. You can score additional points by going on a shakedown cruise which is another "resource" that you can get as part of an action from the rondel. Thematically it does make sense but it seems like a tagged on game mechanism to me. Granted it does score you quite a few points but will require some planning and a bit of luck. Oh 1 thing to note is that if you have enough money, you can purchase additional action during your turn for 6 coins. In our game, I planned for 1 huge ship and then a smaller one to score some more points. My giant ship only set sail near to the last round of the game and even though 2 other players had sailed a few ships and scored some points in the earlier rounds, my big ship netted me 40+ points and surged ahead to be in the lead. Another player had an amazing wagon-market strategy that gave him so much money but it seemed a little too late because you can only buy 1 additional action during your turn and money at the end won't earn you extra points. I had also thought I was doing pretty well until another player revealed his secret objectives and scored a whopping 54 points from them. That got him the win and I came in 2nd. Its kinda crazy how much points he scored from those objectives. Mine could only get me 27 at most and that was after i had amassed that giant ship. On hindsight I could have build several small ships to achieve my objective too but I can't really see how much more I could get. I do feel that my placement of the shakedown cruise tiles may have netted me more if I had planned better. So while it was an interesting game, I would say Shipyard is something you have to try first before you buy. I won't say no to playing it again but I am not that hot for it. Setup is a big problem though unless you have those plano boxes to store the bits. Thanks for the review. Very agree on Shipyard, I like the game but some people may feel it's too dry and etc ! yea it can be slightly dry. His other game, 20th Century feels more engaging as there is a lot more interaction between players. Thanks, will check it out if given the chance. Once again best wishes.